When a candidate uses online job boards in their job search, they often find themselves searching through dozens, if not hundreds of job ads for positions that meet their search criteria. 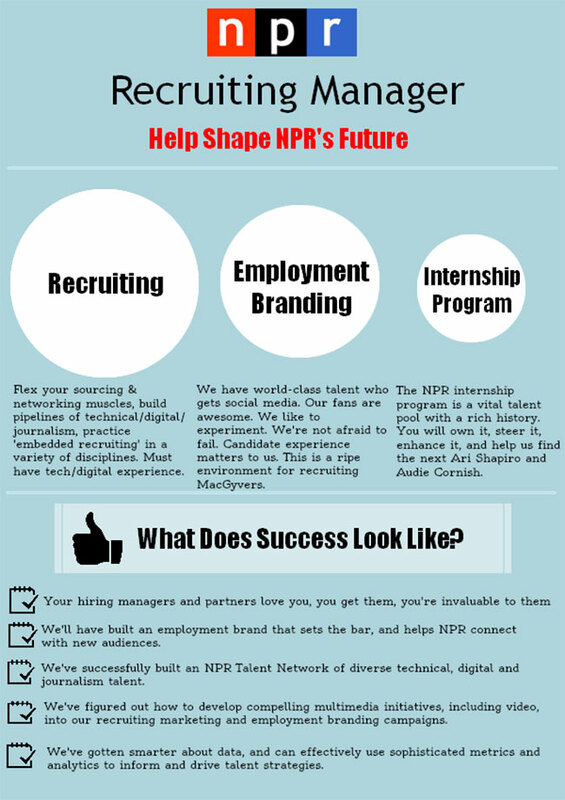 As hiring managers and recruiters, it’s our task to craft job ads that stand out among that sea of job ads out there. The objective is to not only capture every interested job candidates’ attention with these job listings, but to also write them in a way that the right candidates will find a connection to the role you’re writing about. And the ultimate outcome? The talent you’re looking for will actually apply to your job listings and not just skim through the job ad and move on. What lots of people forget about writing job ads, however, is that there’s a HUGE different between your average job cookie-cutter ad and one that nearly jumps off the page in attracting your ideal candidates. It boils down to both WHAT details you include, and also HOW you share those details. Hint: personality and transparency matter. Will your candidates get competitive wages and benefits? Congratulations – so will those applying for roles with all of your competitors and also that other company down the street. Competitive wages and benefits are just “table stakes” now; which means they are the bare minimum thing you should be offering to stand out in the job market, so you shouldn’t spend precious space on your job ad explaining that you do. If it’s a competitive field, your target candidates have definitely seen it before. Keep in mind the science behind motivation (this video explains it well); most candidates are more motivated by intrinsic factors – like feedback and a chance to make a difference – than they are by compensation and benefits. You don’t want to hire employees who can’t meet your expectations, and most employees don’t want to take a job in which they can’t excel. Sharing what success looks like is a great way to bridge the communication gap that leads to poor hires and encourage candidates to apply. Sharing what success looks like helps create a can-do spirit in the candidate, makes your job posting stand out, and above all else, improves their chances for success in the role should they apply and be selected. You may or may not fully acknowledge it right now, but candidates who have any real interest in working at your company are going to do a LOT of their own detective work. Whether that means researching your company right on good ol’ Google, poking around on your social media sites, and reading deep into your career page and on review sites, job seekers are going to be looking high and low for inside information and outside perspectives about your company and the people in it. You can make this part of the whole journey easier – and more positive! – for interested candidates by showcasing on your job listing some third-party resources where they can find information about your company, such as links to your online reviews, recent stories about your company in the news, and any videos that your company or brand might be featured in. By picking and choosing what third-party resources your candidates take a look at first, you have more control over their overall experience. Adding third-party perspectives to your job ads will not only improve the candidate experience for job seekers, you benefit from it too. Adding your company’s star rating to your job listings, for instance, can boost your application rates up to 30%; more applications = more resumes to look through = more chances to find the right candidate. [If you’re interested in putting star ratings on your job listings, contact us and we can help you out]. While an extensive and exhaustive list of duties and responsibilities is likely to bore potential candidates, a snapshot of a day in the life of a _________ (insert role here) can help the candidate imagine himself or herself in the role, in your organization, and start to build their interest and excitement in the opportunity. 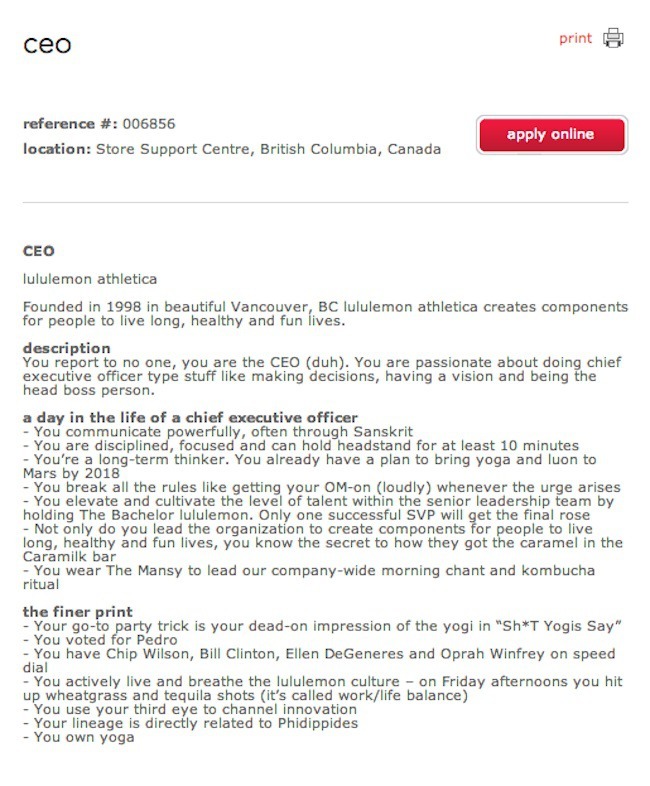 lululemon mastered this strategy in their CEO posting, where they shared these “a day in the life” snapshots, among others: “You are disciplined, focused, and can hold a headstand for at least 10 minutes,” and “You already have plans to bring yoga and luon to Mars by 2018.” Without adding a whole lot of extra wording, this job listing managed to include both the practical details about the role itself – which you still need! – along with some personality and humor that helps the job candidate better envision what all of that actually looks like in reality. With these tips and a little creativity, you can prevent your job post from getting lost in the crowd and attract more of the talent you actually want.